Want to be a bit different this year? Forget sending traditional red roses for Valentine`s Day and surprise someone you love with our presentation box of 20 premium pink tulips. Tulip flowers for Valentine`s Day are a super sweet way to say `I adore you`. 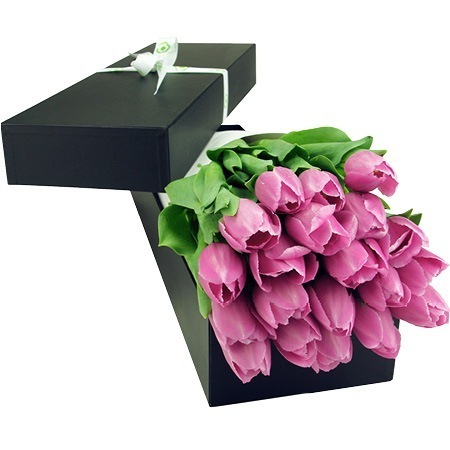 Order your pink tulips for Valentine`s Day online or give the team a call on 1800 66 66 46. Ps. If you want to surprise your sweetheart first thing on Valentine`s Day, why not get your flowers delivered the day before, on Tuesday 13th? That way you will have them ready to go! Hot Tip: Trim your tulip stems at an angle with a pair of sharp scissors before placing then in a clean vase of room temperature water. Then watch their stems grow and dance towards natural sources of light and put on a beautiful show!